The De Laporte waterhole is not a pretty waterhole and it faces north, which is not great for photography. There is also no sign on the busy H1-1 alerting visitors that there is a waterhole here so many cars do not stop, they just drive past and over the bridge. The waterhole has, however, been made more well known due to the resident leopard. 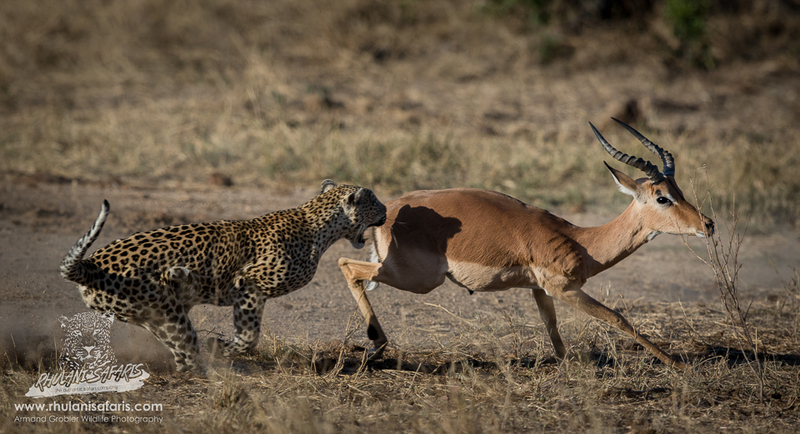 A few very fortunate visitors have witnessed the De Laporte leopard hunting, stalking, chasing and killing prey at the waterhole. 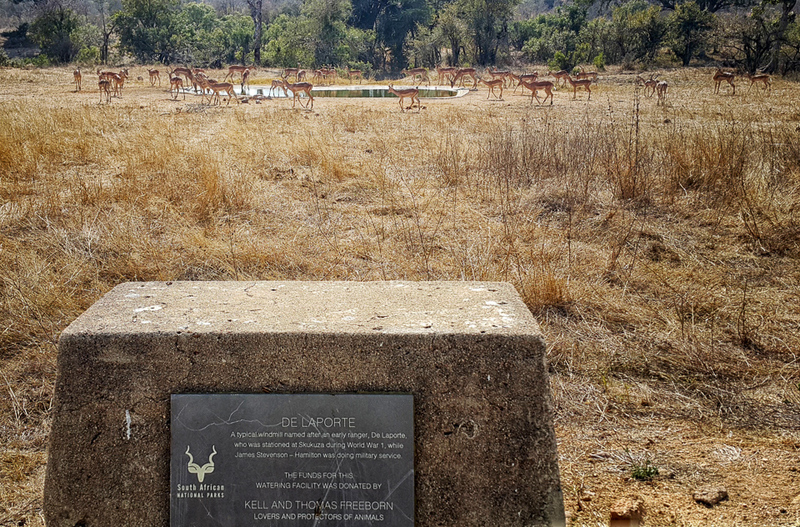 The sides of the concrete trough at De Laporte waterhole are steep and slippery, so impala often slip and fall into the waterhole and, if the De Laporte leopard is waiting nearby, she launches her attack and usually gets the impala in the waterhole. It was a fiery hot day, high thirties (Centigrade) when I was told about her, that she was in the area resting in the shade of a large leadwood tree. We slowly made our way there while observing the other beauties that Kruger has to offer in the form of landscapes and general game. Once we stopped at the waterhole, there was no sign of life, not even a stirring grasshopper could be heard, only an eerie silence. We stopped the vehicle and observed, looking for any sign of her when suddenly, out of the bush a herd of impala casually make their way to the watering hole. 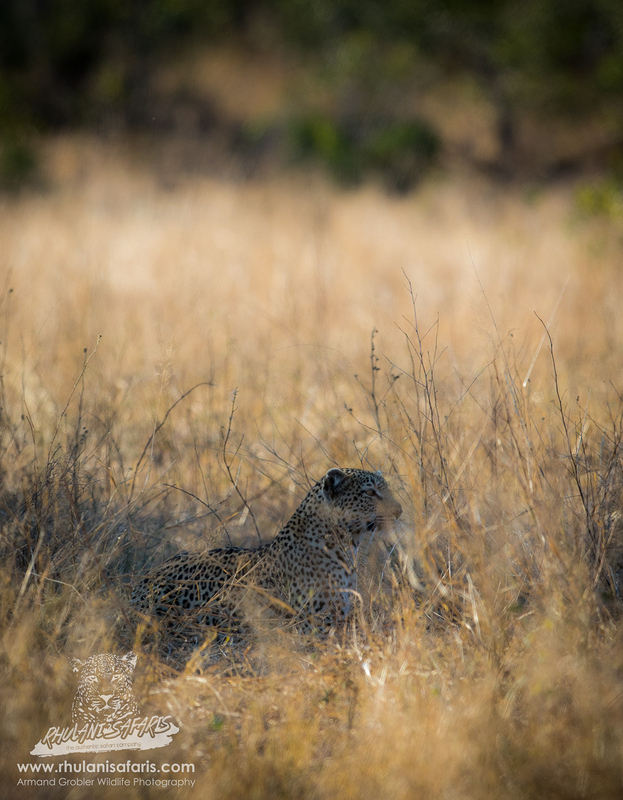 Judging by their ease of presence, almost arrogantly, I thought that we were out of luck and that the De Laporte leopard has moved off, for her species is well known for disappearing into thin air, almost ghostly. 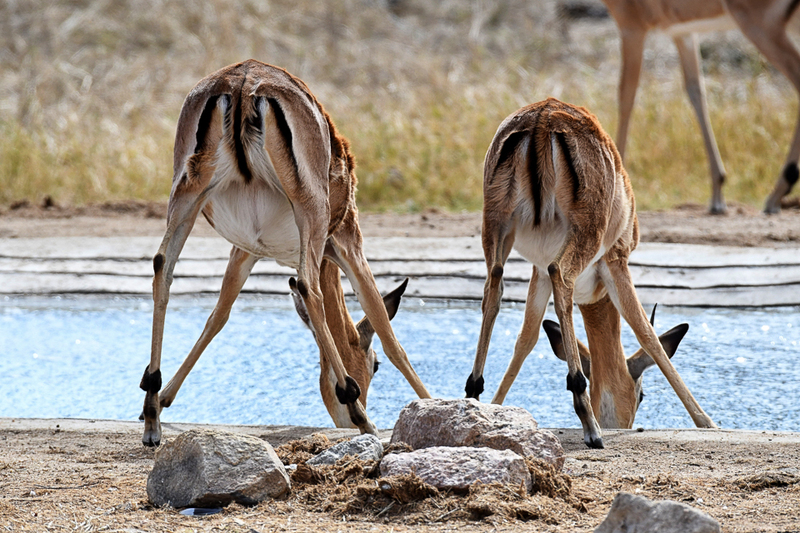 The impalas steadied their way to drink, only slightly observing the area with the flick of an ear every now and then coupled with a quick glance at us to ensure we don’t try anything funny. After about 10 minutes, they had finished their drink and slowly made their way back into the African bush from where they came, with no sign of her at all - or so we thought. A few minutes passed as we were still admiring the beautiful yet dry scene when we saw another herd of impala making their way towards the waterhole, this time more cautiously. The air was hot without as much as a breeze in the sky to cool down our exposed faces. It was then, abruptly, without warning that she moved, given away by only a flick of the tail as she slithered silently through the grass like a serpent towards her prey. One would think you would be able to spot even a scrub hare in the short grass surrounding the waterhole, but not her species that move with unmatchable concealment, a silent predator. She slithered towards the waterhole, intent on getting as close as possible to the life source, in which the impala were slowly heading to, only looking up every now and then to make sure they were still on due course. 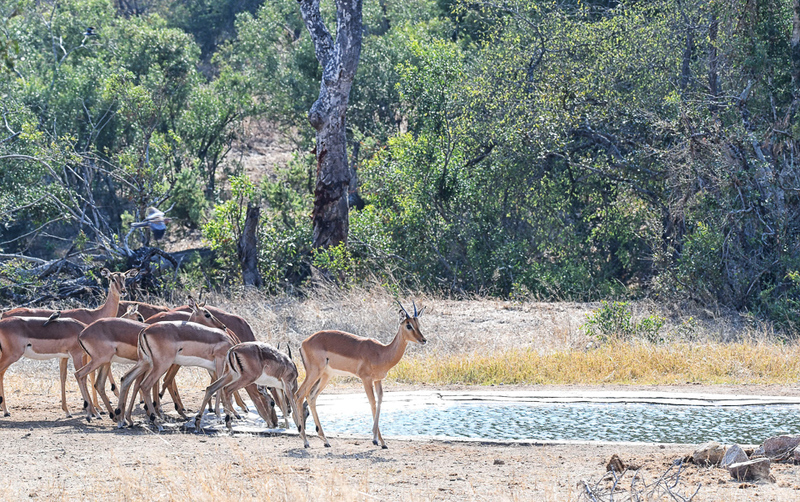 The impala slowly approached De Laporte waterhole, very cautiously and on high alert, as usual when animals approach a watering hole. Hearts thumping ferociously, eyes focused like snipers on their target, we watched in anticipation for what we could possibly witness - you could hear a pin drop in our vehicle. Seconds felt like hours as we waited, losing sight of her in the grass. The air was calm, the sun was baking, we could taste the salty burn of sweat running down our faces and the temperatures were rising to what felt like boiling point when suddenly, like a bullet out of a barrel, dust erupted and the De Laporte leopard shot out in dizzying speed straight for her target. 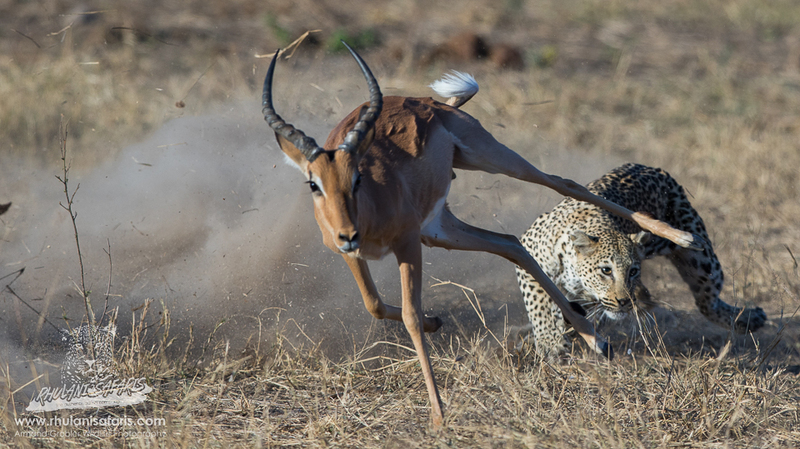 Her only mistake was her small size, as she leapt onto the impala, claws like razor blades slicing into its rump and her canines digging deep as she hit her mark. Time stopped and for a brief moment life stood absolutely still, frozen in an unforgettable embrace. 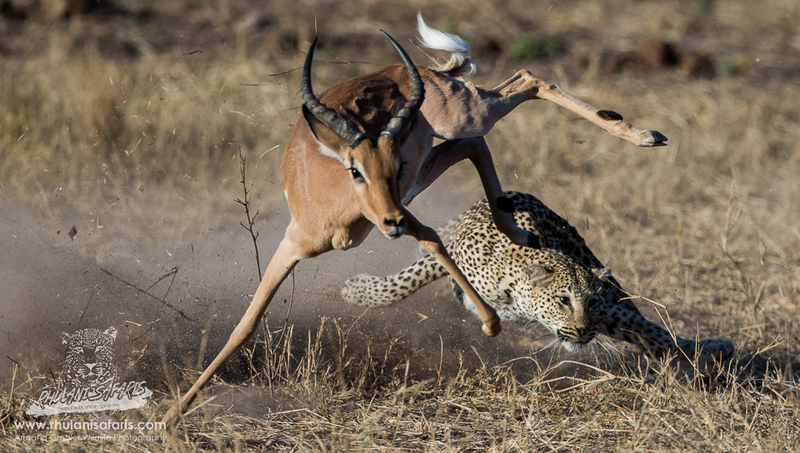 Her efforts were denied by a composed impala, but not without severe pain and effort. She had failed, embarrassingly watching her prey run off into the bush, disappearing in the thickets instantly; beaten by her own meal she wandered off, also melting away like a droplet in the ocean waiting eagerly for her next victim.